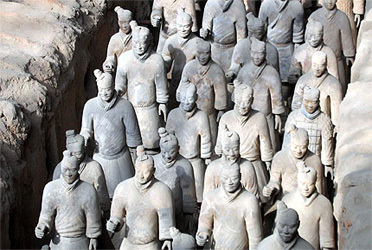 Qin Shi Huangdi needed a terracotta army of life-size warriors to guard him in the afterlife. And the British Museum is looking forward to its most dazzling exhibition since Tutankhamun 40 years ago. Among the unprecedented 120 treasures the Chinese have permitted to be exhibited in London from September 13 are a dozen warriors, a musician, an acrobat, a strongman, a chariot with horses and bronze birds to serenade the emperor in the netherworld. The show is already setting new records: almost 60,000 advance tickets have been sold. Scholars debate whether Shi Huangdi was a unifier or a destroyer during his brief reign 2,200 years ago. But in China he has been rehabilitated as a colossus equivalent to Alfred the Great and Napoleon rolled into one. 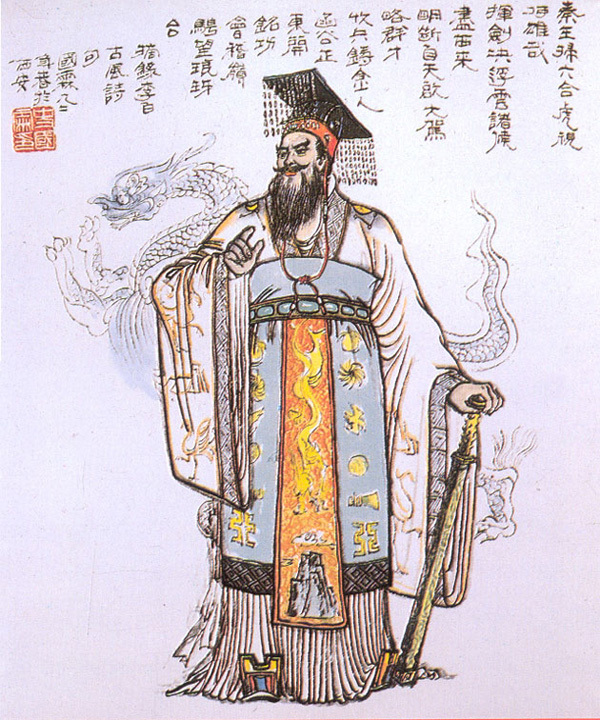 His very title, Qin, pronounced "chin", is the origin of China’s name. He pulled together a bunch of warring states and knit them into a centralised system. His most abiding legacy, according to Frances Wood in her recent book The First Emperor of China, was the survival for more than 2,000 years of China’s bureaucracy, "the largest in the world, staffed by educated men and reaching to the lowest peasant in the land". After his death the emperor's character was assassinated by revisionist historians in the succeeding Han dynasty. There was much to besmirch – such as the story of him ordering more than 460 scholars to be buried alive and then beheaded. This persecution of intellectuals later endeared him to Mao Tse-tung, founder of the People's Republic of China, who rejoiced: "He buried 460 scholars alive; we have buried 46,000 scholars alive." Besides outlawing Confucianism and burning classic texts that offended him, the first emperor became known for the ruthless elimination of defeated armies, estimated at hundreds of thousands. 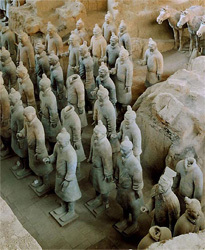 Countless more went to their deaths, conscripted into labouring on the Great Wall. His most significant reforms were to standardise Chinese script, weights and measures and even the length of cart axles so that every cart could run smoothly in the ruts. An extensive new network of roads and canals improved trade and the movement of troops between provinces. Reviled for so long as a mass murderer and the burner of books, the first emperor has at least one solace. 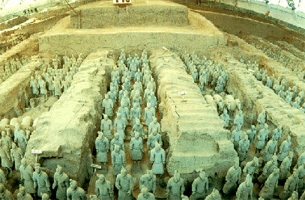 His travelling army of clay warriors are now ambassadors for an ascendant China, providing a thrilling fanfare for the Beijing Olympics.